July 4, 2018. 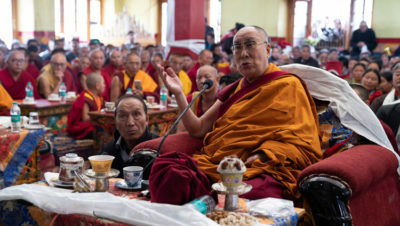 Leh, Ladakh, J&K, India – Following his arrival in Ladakh yesterday, His Holiness the Dalai Lama began the day today with a pilgrimage to the Leh Jokhang. Smiling people lined the streets to greet him as he approached the city of Leh. He was welcomed on arrival at the Jokhang by Tsewang Thinles, President of the Ladakh Buddhist Association and his staff. Led by monks playing horns, they escorted His Holiness to the temple while traditional Ladakhi musicians played in the temple yard. Once inside the temple, which was packed with local people, monks and nuns, as well as laymen and women, His Holiness paid his respects before the statues of Manjushri, Thousand Armed Avalokiteshvara, the Buddha and Guru Padmasambhava. He warmly greeted Ganden Trisur, Rizong Rinpoche, Thiksey Rinpoche and other Lamas before taking his seat facing the statue of the Buddha that emulates the Lhasa Jowo. In his introductory speech Tsewang Thinles saluted His Holiness and other eminent Lamas. He reported that, taking His Holiness’s guidance to heart, the Ladakh Buddhist Association has decided to transform the Jokhang into a centre of learning. They are providing opportunities for people to improve their command of literary Tibetan and study Buddhist teachings with the aim of becoming 21st century Buddhists—people whose faith is based on a sound understanding. And peaceful – free from fabrications. “There have been many founding teachers of religious traditions, Mahavira, Jesus Christ and Muhammad for example, who have conveyed a common message of love, compassion and tolerance. It’s on this basis that in India there is respect for all religious traditions. Inter-religious harmony has been strong here for more than 3000 years. And yet sadly elsewhere today, we see people fighting and killing each other in the name of religion. His Holiness reminded his listeners that Buddhism consists of the Pali and Sanskrit traditions and that the Pali tradition focuses on the explanation of the Four Noble Truths, the Vinaya and so forth. Meanwhile, the core of the Sanskrit tradition is the Perfection of Wisdom teachings that were given on Vulture’s Peak and which emphasize emptiness of intrinsic existence. In elaborating on these teachings Nagarjuna clarified dependent origination, declaring that since there is nothing that is not dependent, there is nothing that is not empty. “I received the ‘Six Treatises on Reason’ by Nagarjuna, as well as several from his Collection of Praises, such as the ‘Praise for the Awakening Mind of Bodhichitta’, from Geshe Rigzin Tempa,” His Holiness acknowledged. “Besides these I have received several transmissions and explanations of rare texts from Khunu Lama Rinpoche and Ganden Trisur, Rizong Rinpoche. “I remember when I was young in Lhasa seeing people in white chubas wearing boots that turned up at the toe who were clearly not well off. They came from the Himalayan Regions and Tibetans were inclined to look down on them. However, these three great masters, who have been kind teachers to me, came from among such people. “We are incredibly fortunate to have a rich collection of literature, the Kangyur and Tengyur, more than 100 volumes of the translated words of the Buddha and more than 200 volumes of works of subsequent, mostly Indian, masters. As a follower of the Buddha, a monk, rather than just reciting the verses of refuge, it is thinking critically about works such as the ‘Five Treatises of Maitreya’ and Nagarjuna’s ‘Six Treatises on Reason’ that has had a transformative impact on my mind. When we critically appraise such texts, we use a logical approach that derives from Dignaga and Dharmakirti, which is a profound means of gaining insight. The temple was filled with applause. 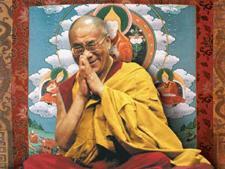 “The reasoned Nalanda Tradition is now only preserved among Tibetan and Himalayan Buddhists. Today, I’m talking about reviving ancient Indian wisdom in India. The Principal of the Government College in Dharamsala has spoken to me about taking the initiative to do this in an academic way. The other day at the launch of a ‘Happiness Curriculum’ by the Government of Delhi I talked about the need to combine modern education with insight and understanding derived from ancient India. I also had the chance to discuss with Abbots from Drepung and Sera how scholars from our great monastic universities can share this knowledge with Indian educators. In March, I was able to discuss this option with 150 Vice-Chancellors of Indian universities. You Ladakhis can take part too. His Holiness explained that just as we train children to be physically fit, teaching them about exercise, diet and hygiene, we also need to teach them how to be mentally fit by training the mind and learning to tackle destructive emotions. He recommended that we all try to understand what disturbs our peace of mind and what brings calm, but stressed that it can be learned not in a religious but an academic context. He further suggested that once India responds to this initiative, China will take interest too. Once that happens 2.5 billion people could be involved, which would be of significance for the world. This, he declared, would be using knowledge preserved in the Nalanda Tradition in a secular way for universal benefit. “The world today is facing a serious crisis of emotions. People think destructive emotions are a natural part of the mind. Advice from ancient Indian psychology can show us they are not and that we can tackle and eliminate them. We need to ask ourselves how to find happiness—it’s not in money and power. As I mentioned before, we need to discover not only what disturbs our minds, but also what the antidotes to those factors are. Stopping to interact playfully with members of the crowd, old people and young children, His Holiness made his way out of the temple to his car. He then drove from Leh back to the Shewatsel Phodrang for lunch.